An all-in-one package of project management functions to keep up with changes in the business environment. The constant advancement of embedded systems means that software development is growing larger and more complex, pushing the limits of development process management but with an often-strained workforce. Software development sites are under more pressure than ever to keep up with a rapidly changing business environment, and must transition to more flexible development methods to deal with these changes. eWeaver is a development process support tool that deals well with change, using only a web browser for higher efficiency and organization in development. The package includes OSS project management tool Redmine and version management tool Subversion/SVN as a base, offering functions for managing the entire software lifecycle, from embedded software development requirement analysis to after-release problem management. This series of management functions allows users to visualize the status of each feature of the products, and improves traceability. In particular, using a backlog plugin provided to support the "Scrum" agile framework, development item management can be performed efficiently using backlogs. This contributes to an increase in productivity, and more flexibility dealing with changes. In addition, a management function is implemented as a tool for traceability between deliverables that tend to get separated, not only tracing the deliverables themselves, but the process as well. This function ensures the level of traceability required by functional safety standards. eWeaver is developed by eSOL, while eSOL TRINITY Co., Ltd. offers sales and product support offers distribution and product support. Please send any questions you may have regarding product implementation to eSOL TRINITY. eWeaver features a unique Redmine plugin with OSS project management tool Redmine, version management tool Subversion/SVN, etc. as a basis, using a cooperation function for documents created with Microsoft Word, Excel, and PowerPoint. Each document type and source code is managed with Subversion/SVN, with project issues, reviews, tests, and other such activity managed with Redmine as “tickets.” “Tracker” is a part of Redmine that classifies tickets and defines workflow, with each part of the development process from requirements management to post-shipping support set with standards. The “Backlogs” screen shows product and script backlogs within agile development method Scrum, for managing the development items in a project. All development items from change requirements to damage response are added to the project backlog, then allotted to each Sprint for development. Each development item can be easily moved using the drag & drop function, so that plans can be easily changed, and current task plans can be checked at a glance. Because of this, change requests from customers, development plan changes, etc. can be flexibly dealt with. The “Billboard” screen is a task board for each developer to visualize work tasks. The horizontal axis shows tasks status, so that users can visualize the progress status for each task. Drag & drop can be used to transition each task to different areas on the screen. Because of this, the task progress status of the entire development team or each developer can be checked in real time. A function is provided to extracts (authors) traceability items embedded in each type of document and source code, then manage the relation between items. Thanks to this, when a change request occurs during development, the range of influence on tickets and deliverables is automatically extracted so that total impact analysis can be performed. These functions are implemented as a unique Redmine plugin, along with an add-on that links to Microsoft Word, Excel, and PowerPoint. The familiar Redmine UI has been adopted for use. Since it is web-based, it can be used anywhere online access is available. It is compatible with Microsoft Edge and Internet Explorer, Google Chrome, and Mozilla Firefox web browsers. 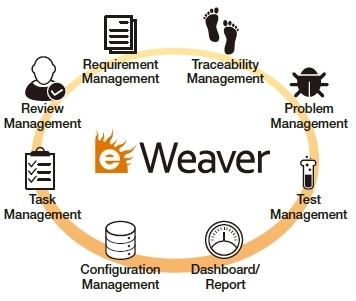 eWeaver is useful for gathering evidence required for compliance with functional safety standards in software development methods as well as process accuracy. In addition to eWeaver sales and product support, TRINITY offers comprehensive support for site development, including pre- and post-implementation consulting and training services for making process improvements, meeting functional safety goals, etc. eWeaver is developed by eSOL and sold by eSOL TRINITY. It is available in the following two formats. Using the Cloud service provides an increase in server capacity to deal with changes in the development system, while allowing multiple offices to share information. The “Cloud version” is a service called “eSOL TRINITY Cloud” provided by eSOL TRINITY. The “On-premises version” is implemented and operated at the customer’s own facility.